This gifted comedian seamlessly weaves both music and comedy in his shows, as well as an uncanny ability to involve any audience in the act. 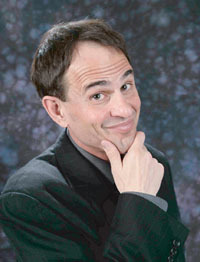 Whether opening for various heavyweights such as Lee Greenwood, Mario Lopez, Three Dog Night, Bill Engvall of the Blue Collar Comedy Tour, his comedic versatility and showmanship make him an entertainer audiences won't forget. He is the perfect choice for corporate comedy, whether an after dinner show, to emcee an awards banquet, or just to let your employees have a good clean night of well-deserved fun!